Last year was a great year for Olu Maintain after he released his single 'Nawti' which featured a cameo appearance from American model/reality TV star - Natalie Nunn. 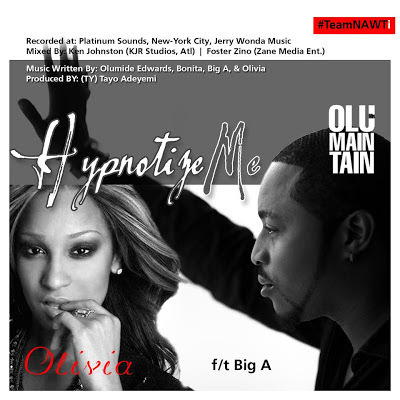 Now the 'Yahooze' singer has teamed up with New York's very own singer and reality TV star (Love and Hip Hop NY) - Olivia for this new track he calls 'Hypnotize Me'. Olivia who was previously signed to 50 Cent's 'G-Unit' records is now signed to Jerry Wonda Music's record label who has produced for the likes of Keyshia Cole, Miguel, Keri Hilson, Mary J. Blige, Justin Bieber and a whole lot more. Also on the track features a rapper from Atlanta who goes by the name of Big A who drops some hot bars. Both Olu Maintain and Olivia do a GREAT job on the track - and Olu Maintain still keeps it African as he sings in Yoruba on the track. The song was produced by TY (Tayo Adeyemi). It would have been nice if Olivia sang in Yoruba as well, or what do you think? She has an amazing voice on her that Yoruba would sound sweeeet coming from her! Doesn't 'Hypnotize Me' sound a bit like 'Nawti'?